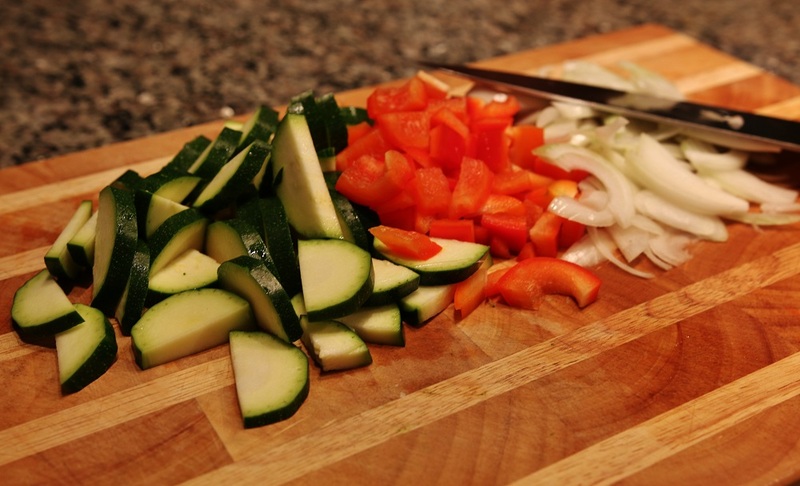 Chop vegetables for sauce, cut zucchinis into half moons, bell peppers into chunks and slice your onions. Slice onions by peeling the skin off, cut through the root and slice. Once your stock and cream have reduced to sauce consistency (*chefs tip* if you are unsure take a spoon and dip it into sauce if you can run your finger down the back of the spoon leaving a trail you are ready to go) you can now add your pasta. 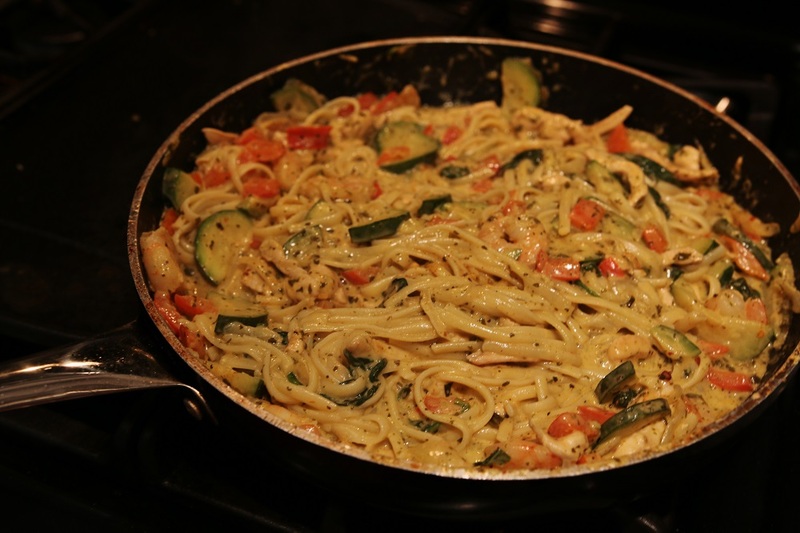 Remember cook pasta while cooking off your vegetables. 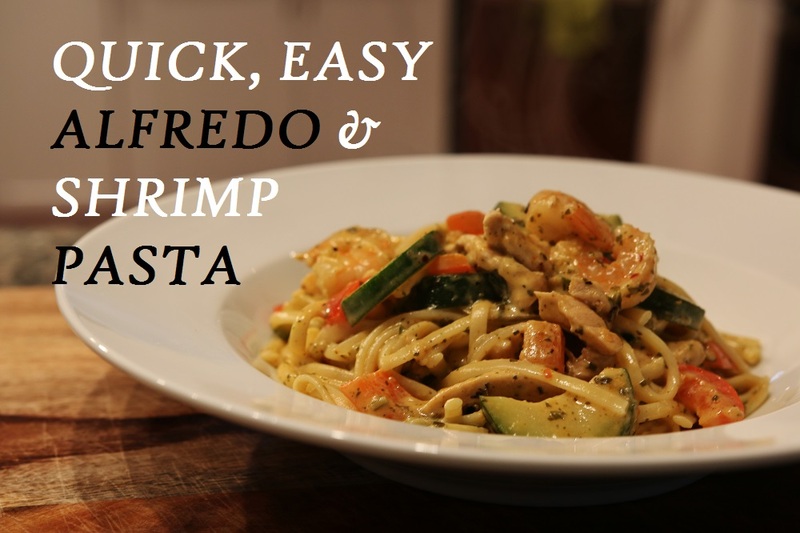 Also remember to add your shrimp just before you toss your pasta. Only do this if your shrimp is already cooked. If you are going to be adding chicken to this recipe you want to partially cook your chicken first Add half of your Cajun spice and allow to cook out. If you do not want to add chicken and just want to stick to the main recipe, skip to 2 step and then start cooking out veggies. Save remaining Cajun spice till later. While cooking chicken start boiling water for you pasta. Make sure to salt and oil your water before you add your pasta. Adding salt to the water flavours your pasta during the cooking process and the oil makes your pasta not stick together. Make sure to stir every couple minutes. Cook pasta till al dente. Drain and set aside, (do not rinse pasta after cooking, by not rising pasta it allows sauce to stick better). 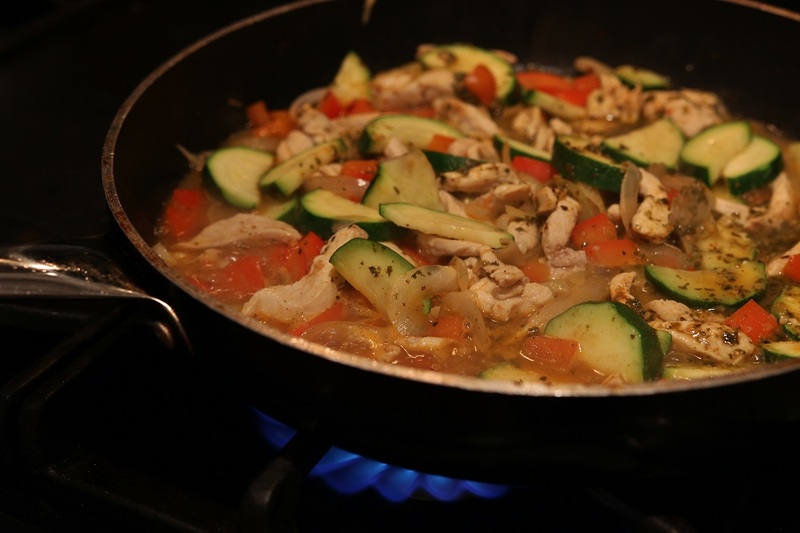 Once your chicken is partially cooked start building your sauce, add veggies (red pepper, zucchini, onion, garlic) Allow to cook for 2-3 mins on low to medium heat, make sure to not fully cook out because you do not want to over cook your vegetables since your sauce will need to reduce. Add half your Cajun spice, and if using uncooked shrimp this is the point you want to add them into your soon to be sauce, (if using cooked like I did don’t add them yet). Save the remainder of Cajun spice till later. Once you cooked your veggies for 2-3 mins add your basil pesto. Cook for another 30 seconds then turn heat to medium heat, add stock and cream. Add remainder of Cajun spice and spinach. Let sauce reduce for about 4-5 mins. Chef's Notes: If using fresh pasta make sure not to over cook and add pasta at very end, right before serving. Other great proteins you can use if you don’t like shrimp, are (chicken, scallops, tofu, lobster, or even just straight veggies 🙂 All different combos you could try! I usually like to use uncooked shrimp but I only had cooked on hand so I made due. 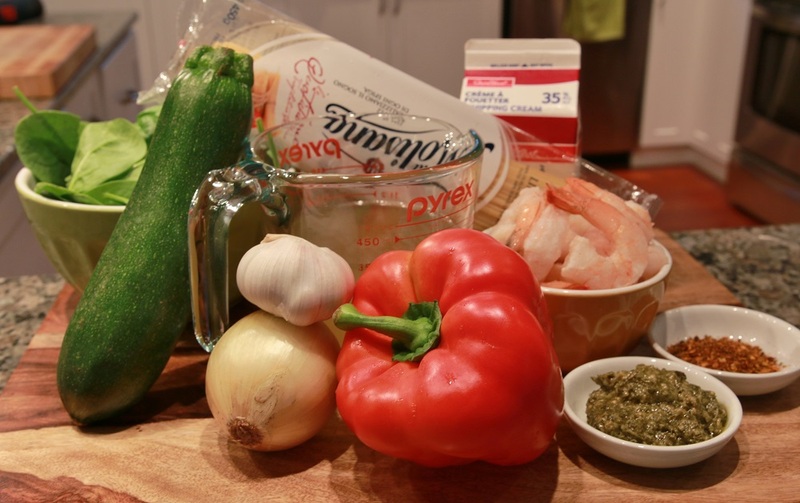 If you are using cooked shrimp make sure to add them in last before you add your pasta. They are already cooked and don’t want to over cook them, they will go rubbery. If sauce is to thick or not thick enough add more liquid, whatever you have left over stock will thin it out and the cream will thicken it up, you will just have to cook out for a little longer when adding more cream to reach desired thickness. Remember to taste while cooking, I cook by eye and taste as I go so you may have to add a bit more basil pesto and or Cajun spice to sauce. Because I didn’t measure just went with my judgement. Ingredient amounts are just a guide line. 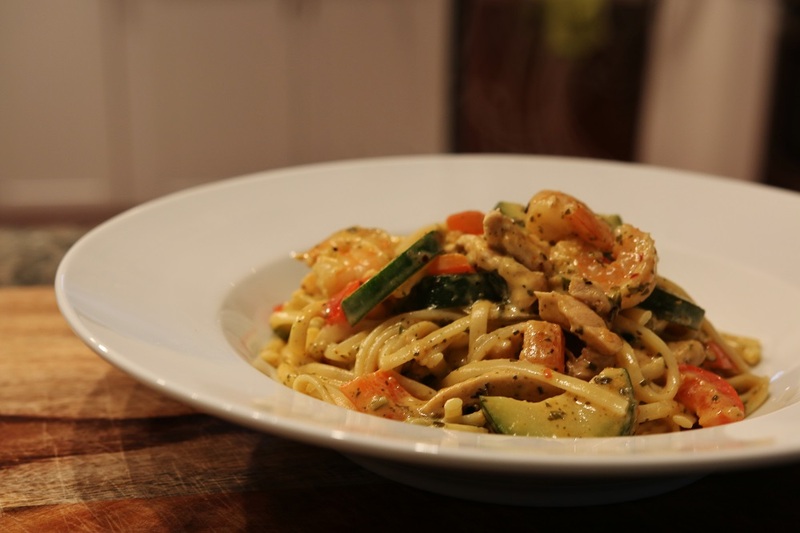 This entry was posted in Main Dishes, Pasta, Recipes and tagged chicken, main dish, pasta, seafood. I saw this blog for the breakfast sandwich. I like your recipes, so please keep posting! Thanks 🙂 I really do enjoy cooking and sharing recipes, I can actually cook things that are a little more complex then a silly breakfast sandwich, I just figured it was a really simple recipe that absolutely anyone could make.